This spunky home is studio sized and environmentally friendly. With it’s small size, the solar panels are able to provide ample electrical support. A cloth overhang keeps a part of the patio shaded as well as keeping the sun from heating up the container through the large windowed doors. Yellow is a wonderful color to accent, and this designer has chosen home decor with colors of gray, orange, and white, and in quirky shapes that balance out the blocky structure. The patio is larger than the home itself, which goes well with being eco-friendly and surrounded by nature. 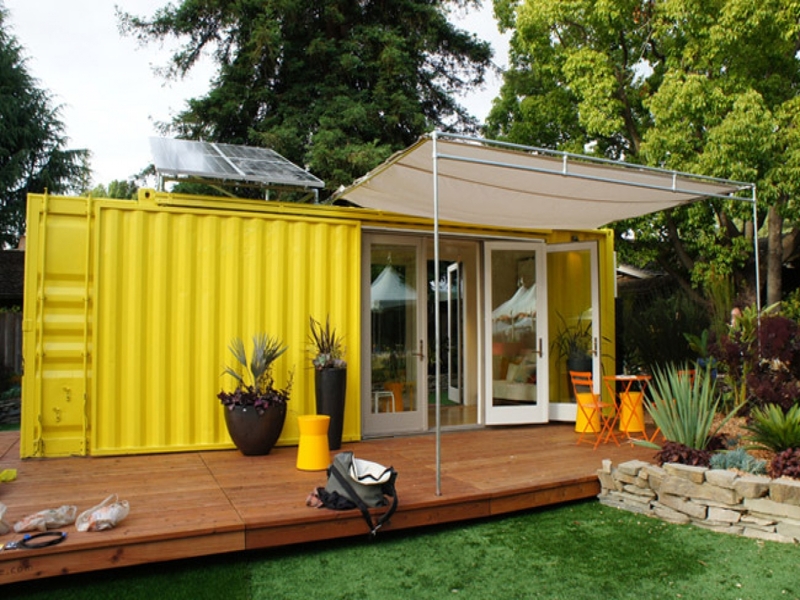 Fun shapes and simple structure make this stand out from other shipping container homes. Hiding the staircase is a distinct white wall that brings to mind a hand saw. Any exposed patio area is bordered with orange guardrails, giving the overall appearance of a construction site. Having large windows at the end of the containers, as well as keeping the doors on and leaving them ajar, is a fun way of making it feel like its a work in progress. Inside, however, it’s completely finished and uses linear and modern design techniques to keep the space feeling clean. 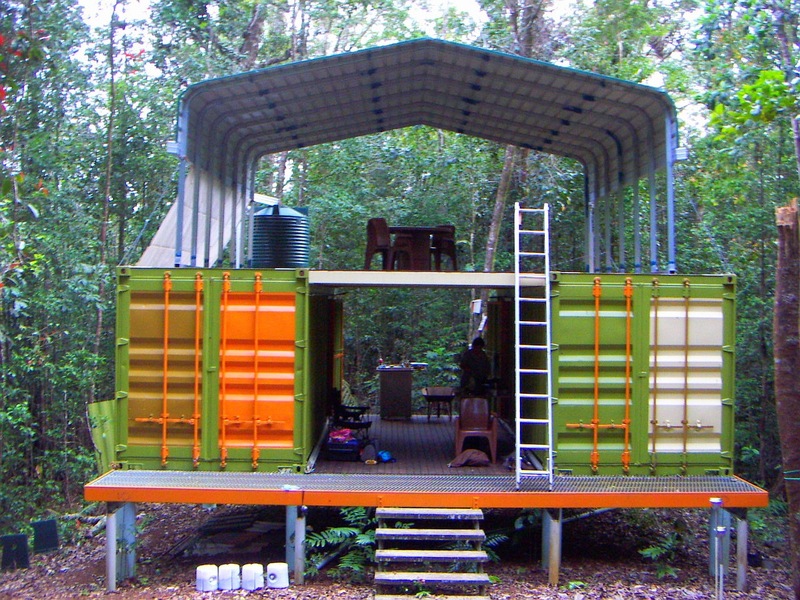 Storage container homes don’t need to be modern or in the city to be unique. This home seems like a backcountry dream, with two covered patio areas and two separate living quarters. No worry was had over flattening the ground to build on, as the entire structure is lifted onto concrete supports. The green, white, and brown blend well with the surround forest. The containers are also strong enough to easily hold rain barrels or family sized water silos. For the family that enjoys being outside, this is a great design. This chromatic home is smartly placed in such a way as to provide shelter underneath for what could be a garage or sitting area. Large windows at the ends of the containers allow sunlight to enter the home. By staggering the placement, the designer was able to keep the home intriguing to the eye, instead of would have been just a square. The idea for the front door to be set back with a small porch area is quite ingenious, especially since the other half of that end could easily double as an inner closet. Outside, the patio flag stones keep in line with the very natural surroundings, and the red and orange colors of the home itself compliment the green country side. 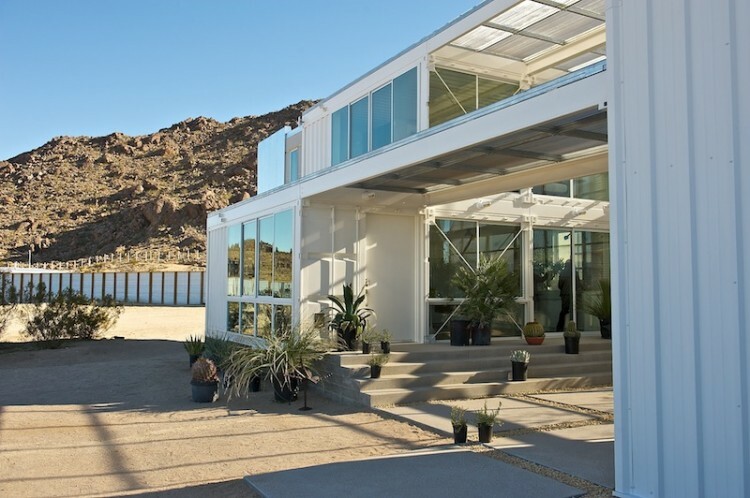 Another example of clean and bright container houses, this home utilizes a sharp white color on all exterior parts. Floor to ceiling windows create an open appearance, even from the outside. The staircase and outer patio is studded with potted plants local to the climate and area, also helping the home look less out of place. Using the bottom or tops of storage containers gives the outer area shade that also matches the rest of the home design and the shape of the home creates a natural inner courtyard. 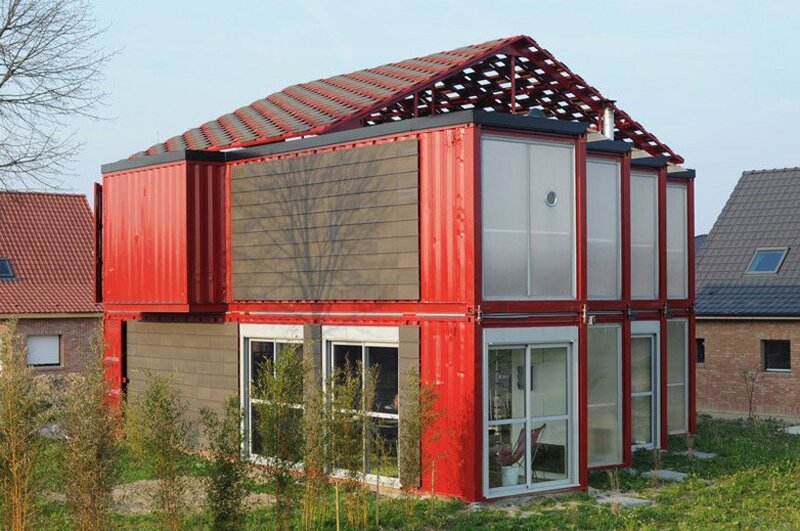 Container homes can take many shapes and sizes. In this home, we see a sandwich affect, where the containers are placed on the middle floor with a patio on top. Large porches project out of the middle floor, providing a great space to enjoy the outside without being too effected by rain, wind, or hot sun. There is also a neatly designed patio space beneath the storage containers, wider and more able to be used by groups. The entranceway separating the two groupings of containers seems to also double as a stairwell to the upper patio. Contrasting each other, the small, narrow windows on the first floor keep more privacy, while the large, wide narrows above them let light flood in. 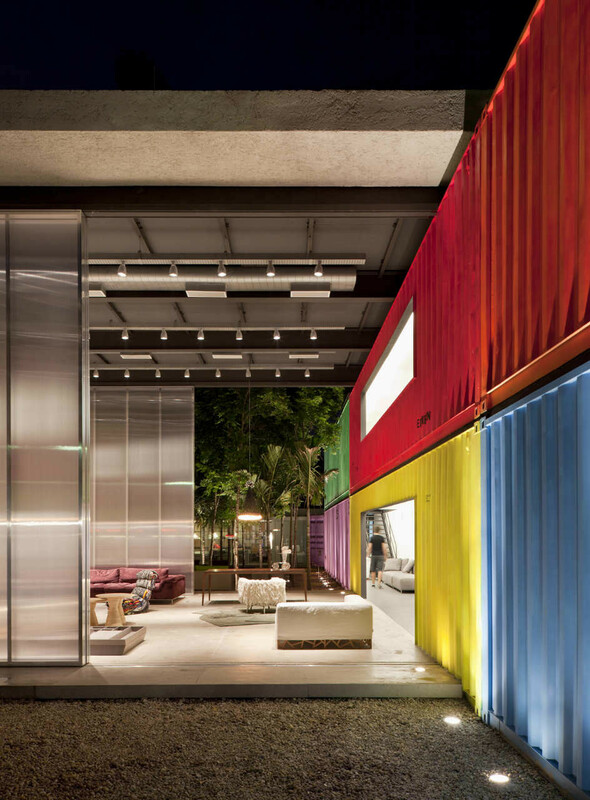 Container homes naturally lend themselves to vertical lines that designers play on to increase height and add dimension. This home, fore example, has artistically placed wooden beams that sit along the ridges of the container and help the eye travel upward. It also helps the home itself is situated above the ground, with stairs leading up to a raised patio. Trying to use as much light as possible, the patio is made of reflective materials and helps create the illusion of more light. Odd angles and sharp corners abound in this shipping container house, seen in the landscape edging, walkway, and partially jutting out roof. Not a fan of the flat roof design? 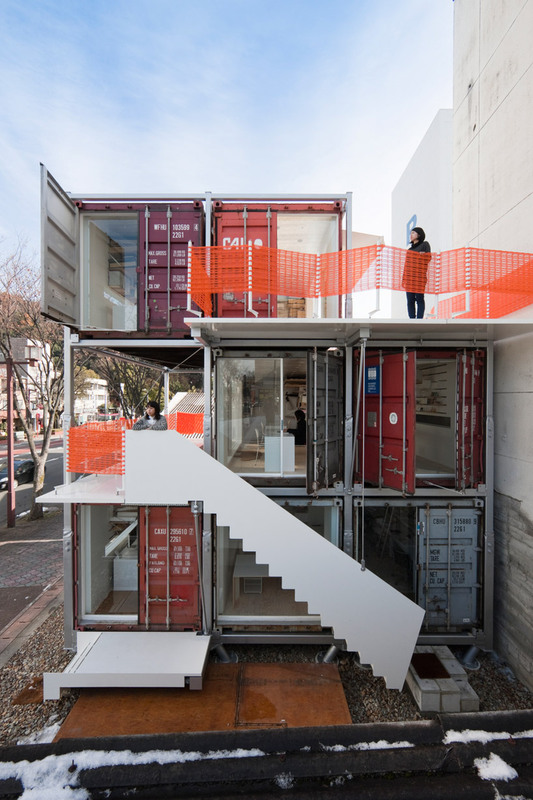 Perhaps this storage container home is what you need. 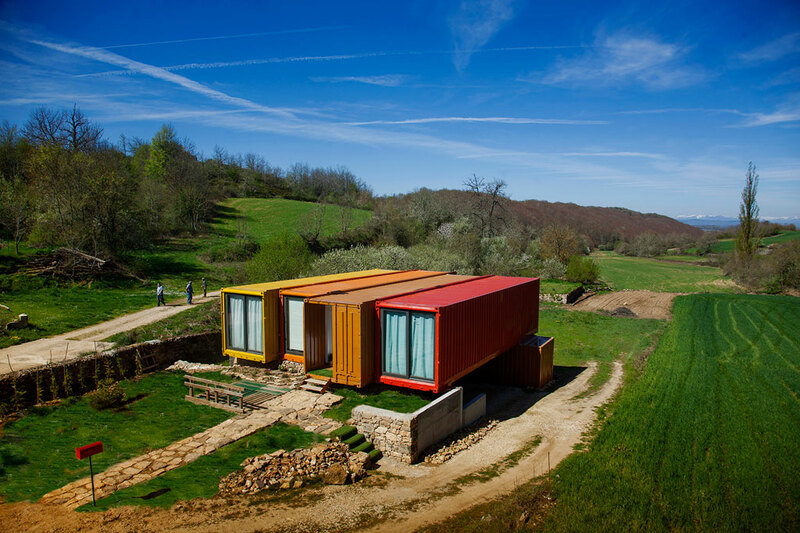 Eight containers situated alongside each other allow this house room to breathe and stand out. Varying the monotony of the sides, the designer has chosen to place a separate color and texture to help the home be less ostentatious. Each container is capped with large windows, with many of those windows being glazed over for privacy. 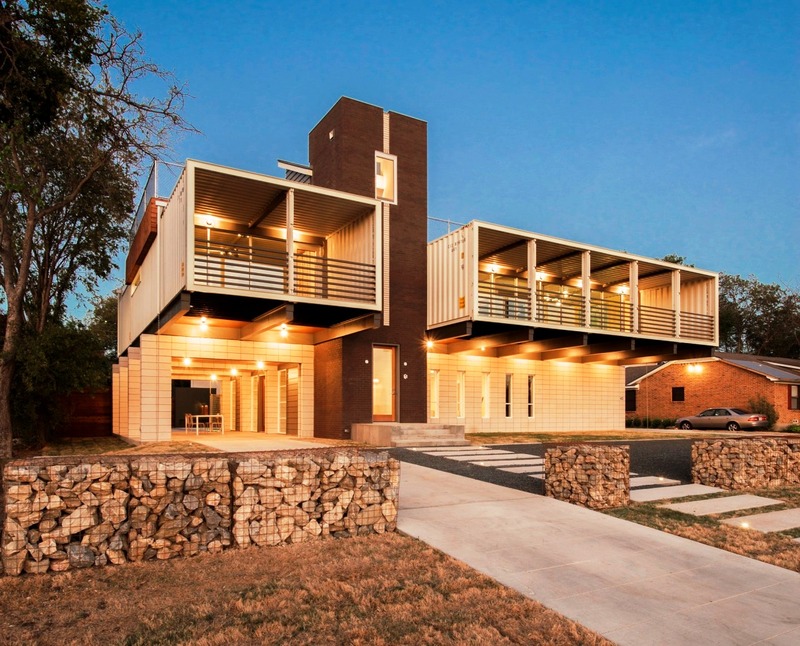 A funky, checkered roof gives the impression of belonging in your average subdivision, but another look lets you know that this shipping container home is one of a kind. The storage container doesn’t have to be the main part of the house. In this example, the home stretches from a large living area that stays open to the outside and benefits from a high ceiling and ample natural light. Beside it, and seemingly holding it up, are multiple containers. Painted in vibrant colors, and having no door to speak of, these statement pieces keep the rather factory feeling living area fresh and alive. Using bright colors in a container house can keep it from feeling stale, which metal boxes tend to do without assistance.